MSI has unveiled its flagship graphics card – with the R5970-P2D2G taking advantage of the latest AMD ATI technology and claiming to be the best performing product in the market. 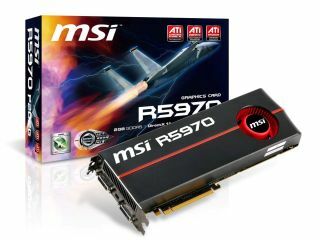 Boasting ATI Eyefinity – which allows you to connect multiple monitors – MSI has also packed in its own technology to produce its finest card. The company has even gone as far as to suggest that its two advanced 40nm GPUs, utilising 3200 stream processors, and 2GB 512-bit GDDR5 graphics memory, make it the 'best performing card on the planet today'. Of course – the ATI tech means that this is built for Windows 7 and Direct X 11, and MSI's 'Afterburner' tech allows you to tweak and overclock to your heart's content. "World renowned graphics card and mainboard brand and manufacturer, MSI, captured the hearts of powerful performance enthusiasts after unveiling its all-new R5800, R5700 series of graphics cards," said MSI's release. "Now, MSI unveils its top model, the R5970-P2D2G graphics card, which not only equips two advanced 40nm GPUs, but also utilizes 3200 stream processors, and 2GB 512-bit GDDR5 graphics memory, making it the best performing card on the planet today!"